Did you know that almost all commercial eggs today, including those that are organic or Omega 3 eggs, contain soy protein in the yolks? 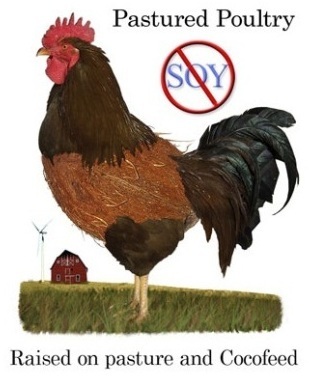 Even chickens raised on organic feed eat high concentrations of soy beans. So if eggs are a part of your diet today, so is soy protein, whether you realize it or not. Tropical Traditions wanted to offer a soy-free egg from chickens that eat NO SOY. Their soy-free organic eggs have been tested to be soy-free! Their chickens are raised by family farmers and eat a coconut-based soy-free feed mixture that is certified organic, with no genetically modified grains (no GMOs!). Tropical Traditions developed the feed their chickens eat: Cocofeed. Cocofeed is an organic chicken-feed ration that contains coconut pulp as well as other high-quality natural ingredients. The coconut pulp is the residue left over after coconut oil has been extracted from the coconut meat. Cocofeed contains NO soy. Why No Soy? Soy has become a big part of the human diet post World War II, with the result that there are many people with soy allergies today, and many people today are trying to reduce or eliminate soy protein from their diet. (See the book: The Whole Soy Story). If you believe you are allergic to eggs, it could be that you are in fact allergic to soy protein that researchers have now found to be present in egg yolks. Soy is the cheapest protein available today, and it is a major component of most animal feeds. Cheap soy protein allows chickens to grow the fastest, and produce the maximum amount of eggs during their peak laying cycles. In tropical cultures, coconut has been a traditional ingredient in chicken feed for hundreds, if not thousands of years. The coconut pulp residue left over after coconut oil is extracted from the coconut meat is still a common animal feed component today in places where coconuts grow. This coconut pulp is high in fiber and protein. Mechanically extracted coconut pulp was also approved by the FDA as an animal feed and listed in the AAFCO (Association of American Feed Control Officials, Official Publication) as early as 1955. While coconut cannot supply ALL the nutritional needs of chickens, there have been studies done in the Philippines and elsewhere showing how coconut pulp can be a major component of chicken feeds when combined with other quality ingredients. Some of these studies are more than 50 years old! Highest Omega 3 Content! Tropical Traditions doesn't simply add flaxseed or flax meal to their chicken feed to make it "high Omega 3." In addition to eliminating soy and using organic coconut pulp, their chickens eat a high quality fish meal and crab meal. Their fish meal is from deep ocean water small fish, and their crab meal comes from the cold waters of the Pacific Northwest or Nova Scotia. They are very high quality products that add not only a high quality protein to replace soybeans, but also the purest form of Omega 3 fatty acids that come from fish sources. Laboratory testing has shown that Tropical Traditions eggs contain almost twice as much of the Omega 3 fatty acids as other organic "Omega 3" eggs that derive their Omega 3 fatty acids from flax seeds. And they not only add high quality Omega 3 sources to their chicken's diet, they completely eliminate the high amount of Omega 6 fatty acids that are contained in soy. Most nutritionists agree that our diet is unbalanced in its ratio of Omega 6 to Omega 3 fatty acids because of the abundance of soy and corn in our diets today. Tropical Traditions organic soy-free high Omega 3 eggs supply a much better Omega 6 to Omega 3 ratio because of the absence of soy. These eggs do not come from "factory birds" where the chickens are kept in cages their whole lives and never see sunlight or go outdoors. In the summer, these chickens are pastured on lush Wisconsin grass where they are free to roam around and eat other things besides their Cocofeed, such as bugs, worms, etc. They do spend more time indoors during the cold winter months, but they are cage free even then, and eat a balanced diet with their specially formulated nutritious Cocofeed. Now, through Sunday, October 9th only, you can purchase these certified organic soy-free eggs which are high in Omega 3 fatty acids at 40% OFF their retail price! Tropical Traditions has developed a special box for delivering these eggs to you! This box is designed to hold four dozen eggs. The box and dividers are 100% recyclable, and no plastic or bubble wrap is used. They have tested these boxes, and the eggs do not break! But even if they do, they will gladly refund or reship, so you can order in confidence! Now, through Sunday, June 3rd only, you can purchase these certified organic soy-free eggs which are high in Omega 3 fatty acids at 40% OFF their retail price. That's a $38.00 retail value for only $27.50 and a $3.49 savings over the normal sale price! Order here: Organic Soy-Free Eggs.